At birth, Ella is inadvertently cursed by an imprudent young fairy named Lucinda, who bestows on her the “gift” of obedience. Anything anyone tells her to do, Ella must obey. Another girl might have been cowed by this affliction, but not feisty Ella: “Instead of making me docile, Lucinda’s curse made a rebel of me. Or perhaps I was that way naturally.” When her beloved mother dies, leaving her in the care of a mostly absent and avaricious father, and later, a loathsome stepmother and two treacherous stepsisters, Ella’s life and well-being seem to be in grave peril. But her intelligence and saucy nature keep her in good stead as she sets out on a quest for freedom and self-discovery as she tries to track down Lucinda to undo the curse, fending off ogres, befriending elves, and falling in love with a prince along the way. Yes, there is a pumpkin coach, a glass slipper, and a happily ever after, but this is the most remarkable, delightful, and profound version of Cinderella you’ll ever read (goodreads.com). 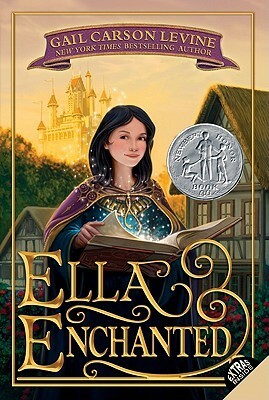 Ella Enchanted is the only adaptation of Cinderella that I have read so far and it was amazing! I loved how Levine was able to combine her own story with some of those from Cinderella to create such a beautiful story. Many of the elements we associate with Cinderella are not found in this novel until the very end including the glass slippers, the carriage, and the royal ball. However, the step-mother and sisters, as well as the fairy god-mother are present throughout. That is pretty much where the similarities end and I was quite happy about that. I am very pleased with this adaptation of Cinderella. I thought the plot of the story was unique and quite interesting. The pacing was pretty much what I expected it to be considering it is a children’s book. It was almost perfect except for the end where I thought it was a little rushed. We spend a lot of time reading about Ella with her curse and don’t get to see much without it except for a summary of all the things she gets to do now. I suppose that is enough information with it being a novel for younger children, but I wanted a little more out of the ending. Oh! for most of the book we get to see Ella carry around a book given to her by Mandy. It is the most amazing book ever and I really want one!!!! I adored all of the characters because they all had their own personalities and I could easily tell them apart. I was surprised to find how well developed they were since it is a fairly short novel. My favorite character was Ella because she is such a kind-hearted, strong, and willful child. I felt really bad for her the entire time and couldn’t wait to see how she got rid of her curse! The relationship between Ella and Char was so sweet! I love that we can really see how much they like each other right away and how even though they do love each other it doesn’t get inappropriate at all, which is great for a children’s book. I know I got all teary towards the end when she has to write him a horrible letter! I was so upset! At least it all works out in the end! There are many other characters that I like as well including Mandy, and some other people/creatures Ella meets in her adventure. On the other hand, there were some I didn’t like at all and that is because the author did such a great job with them. I didn’t like the father because I thought he was horrible at being a father nor did I like Hattie or her mother! They are awful people. I suppose Olive wasn’t too bad. She was just too young to understand and was feeding off her sister and mother. Even the non-human characters were awesome and very well done. These include the elves, ogres, and giants! I thought it was really cool to see a giant couple get married and the ridiculous ceremony it entailed. I thought Levine did an amazing job with her world building. There are many places we get to explore throughout the novel and they are described pretty well. I loved visiting the elves, and the giants were interesting too! She even when as far as creating the languages for the different races, which was pretty neat. However, if you listen to this book on audio like I did for over half of it this part gets rather annoying because it is spoken for you. When I read I can skip over stuff like this for the most part, but not on audio. It was nice to take the time to do this, but just not fun to listen to on an audio book. For such a short novel I thought she did a great job! I really felt like I was there with Ella. There is so much more I could say about this book, but I feel like this review is long enough as it is! This book is fantastic and I can’t wait to read some other adaptations of fairy-tales. I recommend reading the original Cinderella followed by this book because it is fun to compare/contrast the two. Could be something fun for children and parents to do together. If you must you can watch the movie, but I will tell you that it is awful! Next Post Birthday/Christmas Book Haul! So Excited!